The landscape horticulture program conducts extension activities and applied horticultural and plant pathology research that increases productivity and efficiency of various enterprises that comprise the landscape horticulture industry. The plant pathologist provides extension of information on plant pathology subjects and conducts research appropriate to this discipline in ornamental and other agricultural commodities alone or in conjunction with other CE staff. This newsletter is for the people working in the commercial landscape industry. You are Invited to Attend the 2018 Chiricahua Rendezvous. The Chiricahua Rendezvous is a meeting of arborists, naturalists, and biologists to study trees and their adaptations in the Chiricahua Mountains of South East Arizona. The Chiricahuas also offer us a laboratory to examine tree adaptations and natural history up close. The high species diversity, unique land-forms, soils, abundance of insects and animals, and sheer beauty of this part of the American Southwest are unlike anything else in the world. See attached brochure for details and Rendezvous agenda. Exploring the art and science of pruning. This issue contains a pruning survey conducted with Master Gardeners and information about Bot fungi during drought conditions. Hey its Conk Season Keep an eye on your palms! 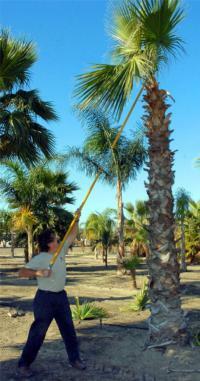 What is wrong with Pygmy Date Palms??? Some factors about soil that you need to know to understand the biology of the oak tree in California. What's Up With The Redwoods? Powdery Oak Mildew - It's Everywhere! Palm Disease Note Fusarium Wilt or NOT?? Roundup--The DDT of the Nineties?